A couple of weeks ago I traveled to Los Angeles to see The Whole Bloody Affair in all its glory. There is a special place in my geek heart for Kill Bill. The cruel tutelage of Pai Mei. Kiddo’s slaughter of Yakuza minions. The Five Point Palm Exploding Heart Technique. The films offer a cinematic feast of fun. I’ve watched each film more times than I can count, I can recite passages of dialogue before characters say them, and I own a replica of Kiddo’s yellow jumpsuit. So, I’m pretty serious about my devotion to this fun film. Walking into the New Beverly Cinema was like rewinding the clock 50 years. 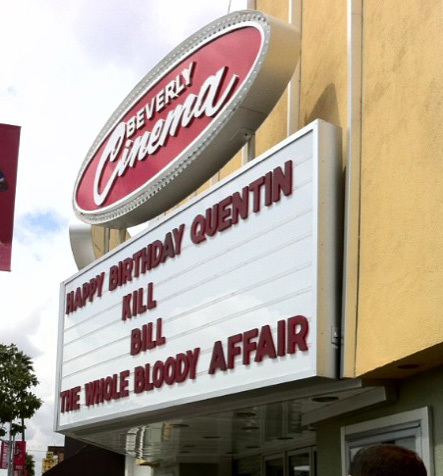 The cinema had a brightly-lit vintage marquee out front, which on the night I went exclaimed happy birthday to our dear Quentin Tarantino. Walking inside, the foyer was tiny, the snack counter was barely existent (but had refreshingly reasonable prices), and the two restrooms combined would have fit into a small broom closet. The one theater housed about 200 seats and the screen was much smaller than most we see nowadays. In short, it was charming. I snagged a front-row seat, which was perfect for the screen distance and size. Before the feature presentation, in typical Tarantino flair, several previews of coming attractions for ‘70s and ‘80s grindhouse genre films were shown, including Coffy, The Million Eyes of Sumuru, and Shogun Assasin (the film that BeBe watches with Beatrix at the end of Kill Bill volume 2). The pre-show reel also included an animated sing-along of dancing concessions urging us to get snacks and Dr. Pepper in retro style and a panther warning us that the film was Restricted. Then the glowing seal of the Cannes Film Festival appeared, affirming that this was the original, personal print from Tarantino’s first screening of this version of the film. With the volume turned way up, the action sequences of Beatrix Kiddo’s roaring rampage of revenge physically reverberated in the audience. You could literally feel the tension. The cinematography looked beautifully visceral on a “big” screen. Now, to answer the question everyone keeps asking me about the film: “So, what’s different?” Actually, several things, some small and others not-so-small. All the action sequences were a little longer and a little more satisfying (if that’s even possible). For example, in the famous scene where Beatrix harpoons the Crazy 88’s, the carnage radiates in technicolor instead of shifting to muted censor-friendly black-and-white. This may not seem like a huge change until you see the difference in stunning color and detail, red blood splattering every frame. There were other differences in the Crazy 88 sequence. My favorite difference occurs after Beatrix plucks an unsuspecting warrior’s eye out; in this version, she promptly shoves the veiny eyeball into another guy’s mouth and he gulps it down in surprise. It can only be described as awesome. Other small details include: a voiceover from Pai-Mei describing how Beatrix must suppress her emotions when she walks away from Vernita Green’s Pasadena home, a shot showing Beatrix does indeed cut off Sophie Fatale’s other arm (leaving her a sad, stumpy figure, perfect for taking a roll down the snowy slope to the hospital), and more blood and guts shown in the anime sequence of Oren-Ishii’s past. I didn’t notice as many changes in the second half of the film after the intermission (what is known as Kill Bill volume 2) but watching the two films together made them feel more harmonious and less disjointed. Perhaps the most significant difference was that in The Whole Bloody Affair, when Sophie tells Bill of Beatrix’s brutality, Bill does not ask Sophie about Beatrix’s daughter. This means that Tarantino’s original intent was to have the audience share in Beatrix’s surprise when she sees her daughter for the first time at the end of the film. In cutting the film into volumes 1 and 2, apparently the powers-that-be decided they needed a hook, and so they added the line about Beatrix’s daughter still being alive, eliminating the entire shockingly emotional reveal in the single film version. Even though the film ran at 4 hours and 11 minutes (not including the lengthy previews), I would watch it again in a second, French subtitles and all. I want a Director's Cut DVD to be released immediately dammit!